The opening game of Sky Sports’ coverage in the UK was a high octane affair with 12 yellow cards and a sending off however; ten-man ADO Den Haag were harshly defeated by a late Mitchell te Vrede goal. In an already hectic season for Fred Rutten, the new Feyenoord head coach decided to hand debuts down the right side to Luke Wilkshire and Bilal Basacikoglu while he dropped young striker Te Vrede in place of midweek scorer against Beşiktaş, Elvis Manu. ADO’s debutant goalkeeper Martin Hansen had to be alert on nine minutes as Terence Kongolo delivered a wonderful cross for former Den Haag man Lex Immers to rise above everyone to smash a header at goal, and the former Liverpool youth keeper tipped over. Feyenoord should have gained the lead on 15 minutes after Basacikoglu threaded the needle for Manu down the right. The striker showed great power and strength to get past Vito Wormgoor but Hansen flicked the ball around the post. The woodwork stopped ADO’s chances going in, twice in succession. On 17 minutes, Mike van Duinen nodded on a corner for former West Brom defender Gianni Zuiverloon to head the ball off the crossbar. A few minutes later, Dion Malone crashed the bar with a great effort from long range that had the supporters inside Kyocera Stadion on their feet and Feyenoord keeper Erwin Mulder on his knees. The hosts impressed after the early scares form Feyenoord but lost their captain Ronald Alberg to injury before half-time and had to be replacement by another man making his debut, 18-year-old Tyronne Ebuehi. Things got worse for Henk Fraser as Mitchell Schet received two bookings within four minutes. Schet dived in on Sven van Beek and then minutes later he was penalised for pulling back Kongolo. Video replays showed that the second should not have been a sending off. 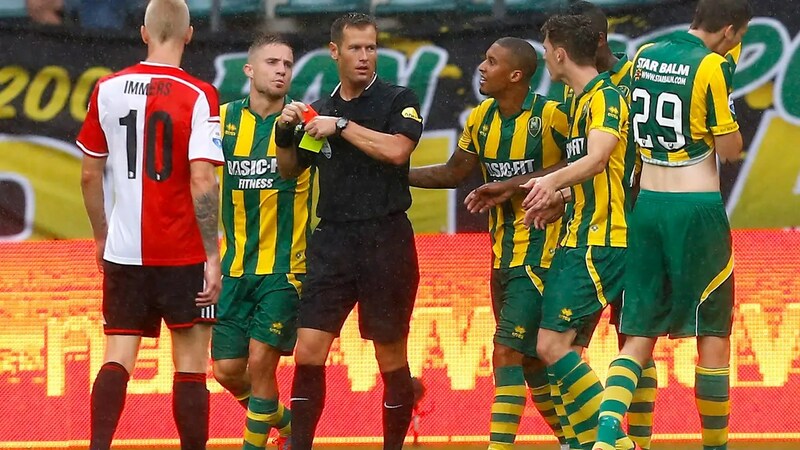 Nevertheless, referee Danny Makkelie dished out the first red card of the Eredivisie season so far and Schet trudged off the pitch. As the rain poured down, ADO lost their discipline and Aaron Meijers was lucky to stay on the field after a two footed challenge in the corner on Basacikoglu. 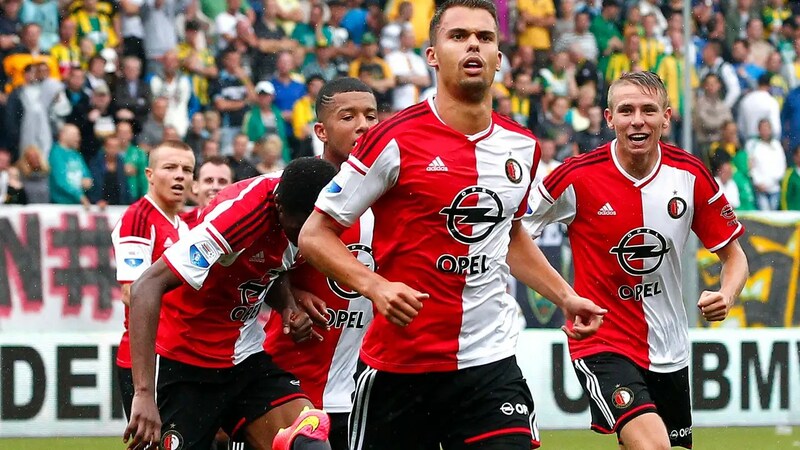 The teams went into the interval all square but Feyenoord, with the man advantage. Still the Rotterdammers failed to get going and really test Hansen’s gloves and it was not until the hour mark that we saw the first real chance. An audacious effort from Kevin Jansen, spotting Erwin Mulder off his line, hit a 45-yard free kick towards goal that just sailed wide with Mulder scrambling to get back in his goal. On 65 minutes, Feyenoord had a free-kick of their own and with a great piece of improvisation, Clasie laid the ball low into the area for Kongolo to crack an effort on goal. Unfortunately for Rutten’s men the box was too crowded and the ball went behind for a corner. From the resulting set-piece, Immers got his head on the ball again but could not get his effort on target. As the time dwindled on, ADO looked the more dangerous as Feyenoord became anxious. The introductions of Te Vrede, Ruben Schaken and later Ruud Vormer seemed to fail to inspire Rutten’s side to the expected victory. Although, In the dying moments, when it looked like the game would not be settled, Mitchell te Vrede snatched the win with an excellent header from a Clasie free-kick. Feyenoord will need to improve if they wish to challenge the likes of Ajax, PSV and FC Twente for the Eredivisie championship. ADO will be disappointed with the result but on the bright this is only their second defeat in the last 14 league fixtures. Referee Danny Makkelie will be in headlines also, as the 13 cards he displayed in this game is an all-time Eredivisie record. ADO: Hansen, Malone, Wormgoor, Zuiverloon, Meijers, Kristensen, Jansen (Merencia 87), Alberg (Ebuehi 38), Van Duinen, Kramer, Schet. SUBS NOT USED: Zwinkles, Kanon, Buwalda, De Vlugt, Houtkoop. BOOKINGS: Schet 36, Meijers 43, Kramer 52, Jansen 54, Zuiverloon 63, Kristensen 65, Merencia 90. FEYENOORD: Mulder; Wilkshire, Van Beek, Mathijsen, Kongolo, Clasie, Immers, Vilhena, Basacikoglu (Schaken 67), Manu (Vormer 81), Boëtius (Te Vrede 58). SUBS NOT USED: Hahn, Vormer, Verhoek, Nelom, Karsdorp. BOOKINGS: Manu 25, Te Vrede 77, Van Beek 80, Wilkshire 82, Clasie 85. Interesting coverage. Ajax and PSV have unlimited cash and have never had the problems that feyenord have had. it is easy to coach psv and ajax. de boer and cocu i think would not last 5 games at feyenord. it is also obvioos that only way psv may be championz is because of all the changes at feyenord. fantastik website !